The Bulk Reception Unit is delivered by a truck and tipped into the reception area of the Truck Unloading Station. As the conveyor aprons with belt move forward, the bulk material hill is conveyed on the upper run towards the drive station. 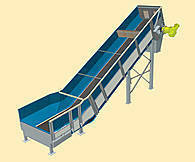 The truck unloading station has the additional function of an intermediate buffer to store the bulk material. This means that the driver can unload his truck completely without waiting time. By means of a levelling plate, the bulk material outflow of the Truck Unloading Station is changed from an irregular truck feeding to a constant. The reception and in feeding of almost all bulk materials delivered by trucks. Looking for Bulk Material Handling Equipments ?